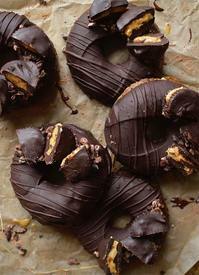 Chocolate dipped pb cup doughnuts! I have a thing for doughnuts! They have to be hands down my favorite baked good of all time! It's actually a scientific fact that everything tastes better when it's shaped like a doughnut! This super over the top creation is without all the processed sugars and refined ingredients.